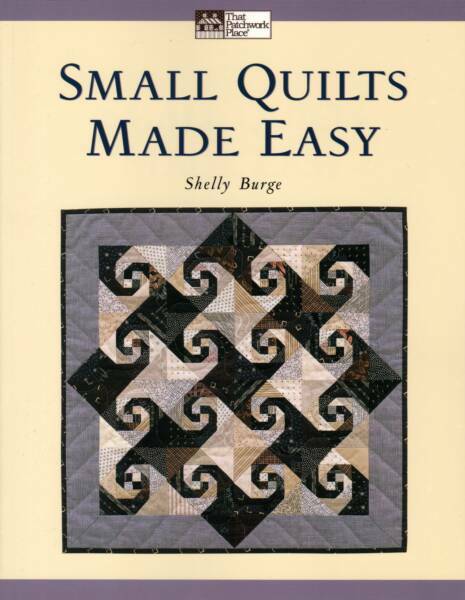 The book includes 15 step-by-step projects; from traditional, antique inspired designs to bright contemporary quilts. 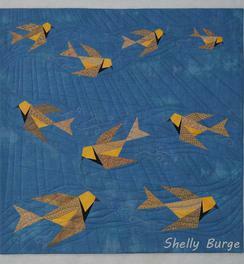 Included are a variety of quick-piecing techniques for miniature and small quilts which can also be used when making larger quilts. Methods include creating original paper-piecing patterns and using freezer paper templates. Tons of tips for making your small quilt a success. Shelly does not have any copies at this time. 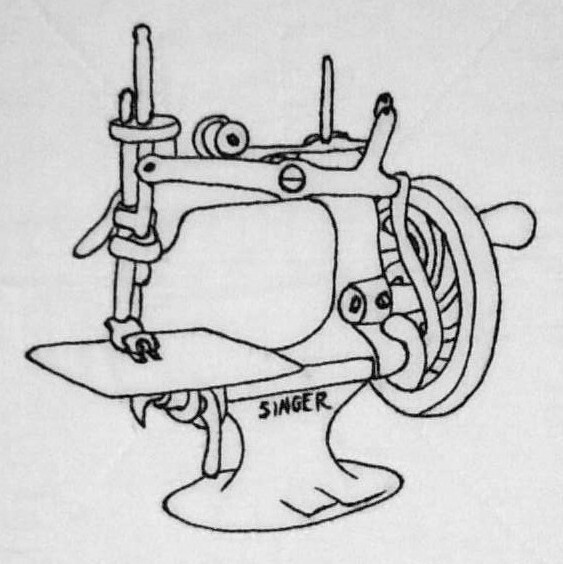 Many quilters took their first stitches on toy sewing machines when they were young. Today men and women of all ages have fallen in love with these detailed little machines and consider them valuable collectibles. Shelly used toy sewing machines from her own collection as the inspiration for this wall hanging. 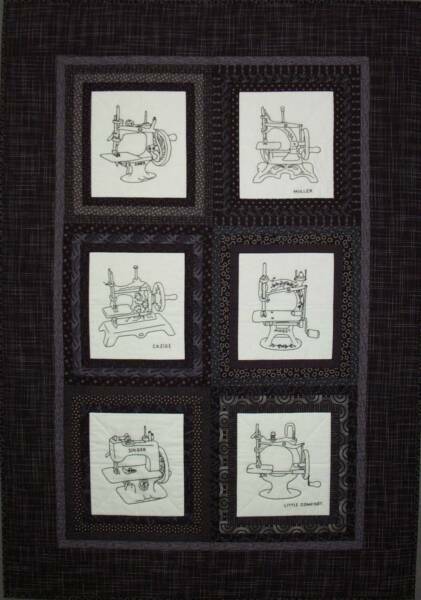 The blocks are hand embroidered and then pieced into the center of a Courthouse Step style block to create this charming quilt. 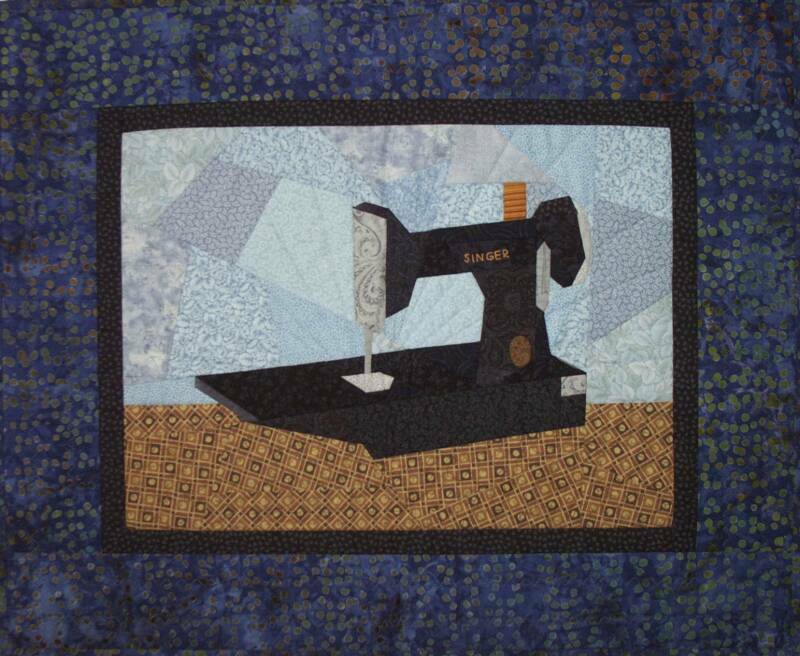 Some quilters search for years to find a Featherweight sewing machine. 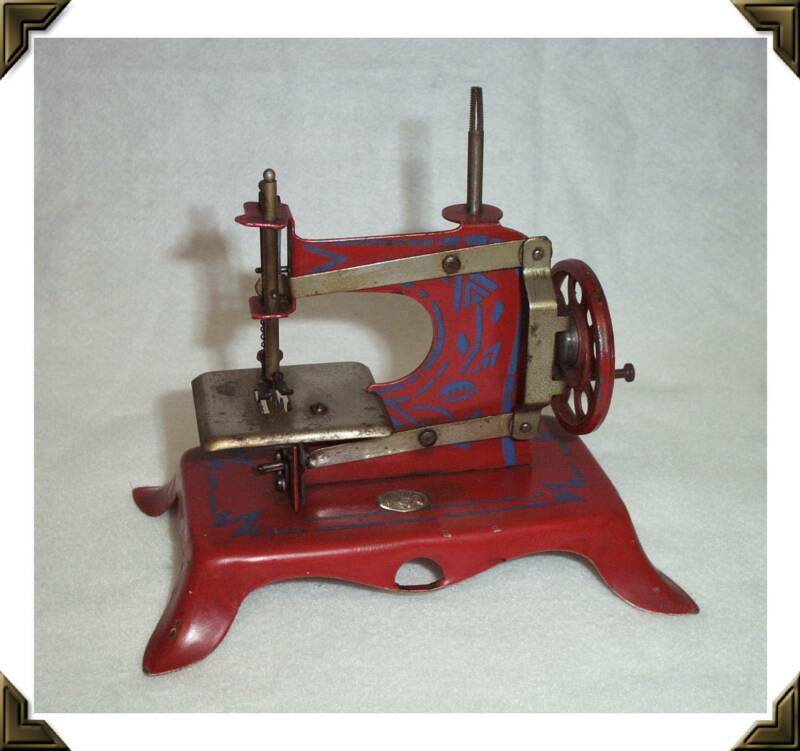 These small vintage machines are considered the perfect piecing machine by many quilters today. Shelly used a 1933 machine from her collection as the inspiration for this wall hanging. 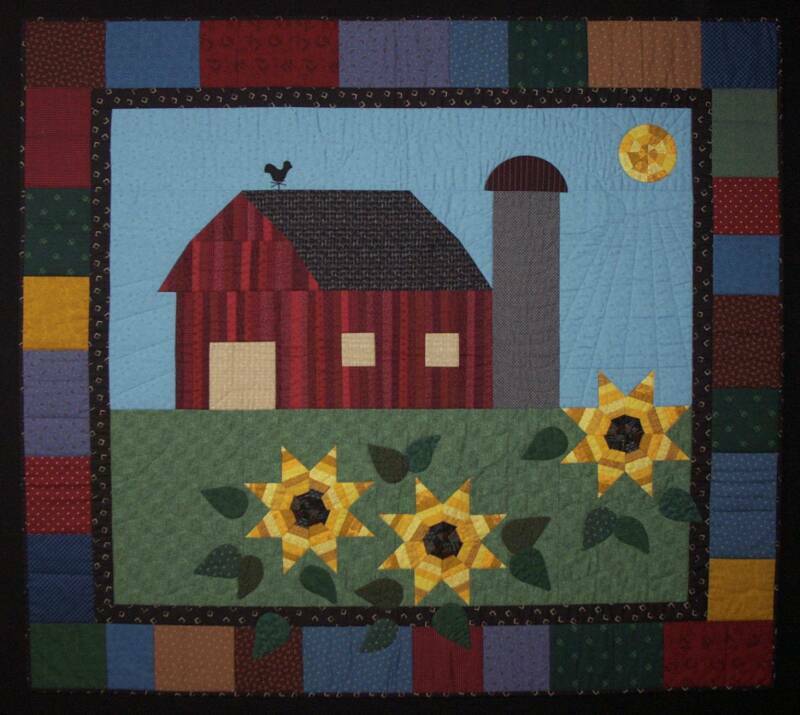 The block can be pieced using either Paper Piecing or Freezer Paper Templates techniques. There are NO set-in angles so it is easy to piece. Featherweights are considered the perfect piecing machine by many quilters and seamstresses. Quilt makers have been known to search for years to find a Featherweight sewing machine of their own. Shelly used a 1933 Featherweight from her own collection as the inspiration for this wall hanging. 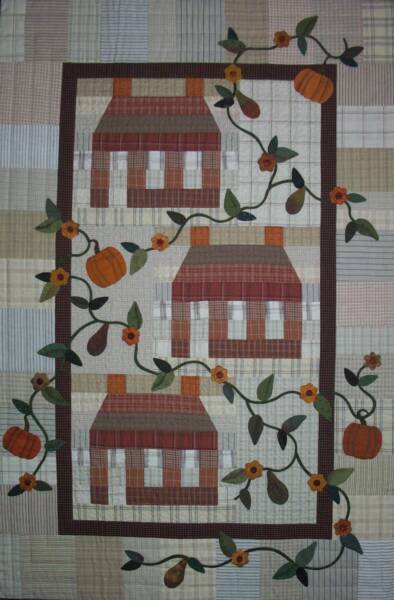 The block is hand embroidered and a pieced Sawtooth border is added to create a charming wall hanging. This wall hanging will brighten your home and put you in the mood to work in the garden. Shelly used soft batik prints to create the look of tender spring blossoms but you could decide to make it from brighter fabrics. The house blocks are strip pieced so they go together quickly and accurately. The easy to follow instructions could be used to make blocks for a bed size quilt. These blocks are beautiful when made up in graduated shades of hand dyed fabric. Fall would be the perfect time to display this wall hanging in your home or enjoy it all year long. It could be made without the applique designs that are sewn over the pieced blocks if desired. The house blocks are strip pieced so they go together quickly and accurately. You could follow Shelly's easy house block instructions to make blocks for a bed size quilt. This wall hanging will bring a smile to your face as you work on it and make everyone who sees it laugh out loud. No offense is intended towards chickens or people who love them. The chicken’s head, wings and feet are stuffed three-dimensional. The flattened parts of the chicken are created using Shelly’s Confetti Appliqué © technique. Machine pieced crazy quilting is used in the borders. This simple country scene invites you to step right in. It features an old barn in the distance and bright sunflowers in full bloom in the foreground. 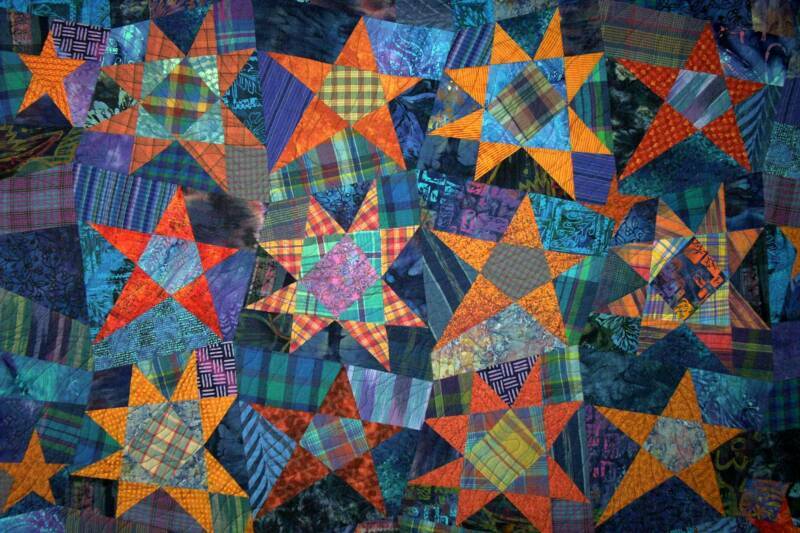 An option would be to use this design as the center of a bed size medallion quilt. 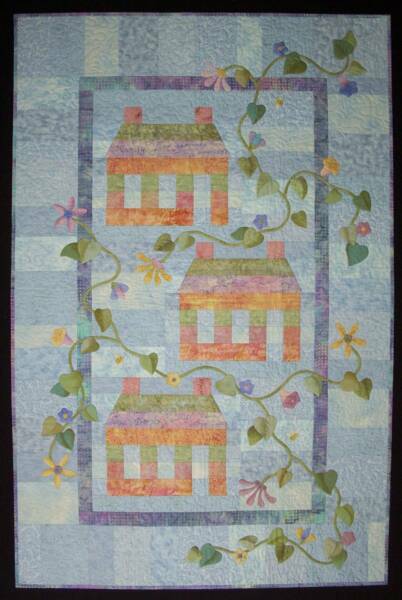 String piecing adds dimension and character to this wall hanging. A wide variety of fabrics are used to create this quilt; you can put your fabric collection to good use for this project. 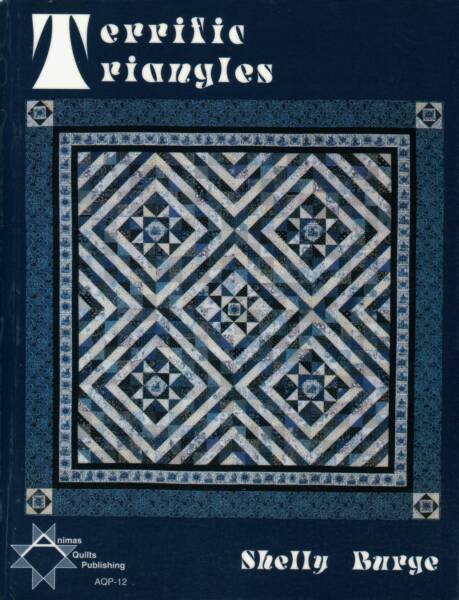 Wholesale pricing for the patterns is available for shops and distributors. with a check or money order please contact Shelly for more information. My wall quilt was designed to celebrate the 150th Anniversary of the state of Nebraska. This quilt can be made using a foundation piecing technique or Freezer Paper template technique. This small quilt might bring a smile to your face, it is a fun project to make. Use a variety of black and white prints to create this spotted cow by piecing with a crazy quilt technique. It can be hand or machine appliqued or even fused.